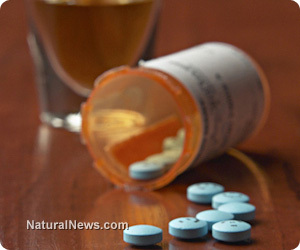 (NaturalNews) The list of antidepressants that can cause sudden death is growing exponentially, with citalopram - under the brand names Celexa and Cipramil - the latest such drug to be added, according to a new study. The research, published recently in the British Medical Journal, revealed that the drug tends to cause a lengthening of the Q-T interval, a part of the cycle of heart beat measured by an electrocardiogram, or what is more commonly known as an EKG or ECG. Indeed, a number of drugs are known for creating this phenomenon, the most notable among them being methadone, which has been documented as causing sudden death in some patients, especially when dosages are increased too rapidly. "There are no symptoms indicating a risk. A perfectly normal person will literally drop dead," writes Heidi Stevenson at GaiaHealth.com. The heartbeat is regulated by a series of electrical pulses, and key points of the pattern printed on an EKG are labeled P, Q, R, S, T. If the time between the Q and T waves is lengthened, it is referred to as "Q-T elongation," or a prolonged Q-T segment; the only way to know if it is occurring; however, is with an EKG. "There are generally no external clues, so outside of testing, you would have no way of knowing that you've been affected," Stevenson writes. Researchers, in their report, were specific about the risk of sudden death associated with Celexa; the larger the dose, the greater the risk. Also, they noted that the Food and Drug Administration has said, "Citalopram causes dose-dependent QT interval prolongation. Citalopram should no longer be prescribed at doses greater than 40 mg per day." That claim is supported in Medscape's drug reference for citalopram. "Doses above 40 mg/day are not recommended because of risk for QT prolongation without additional benefit for treating depression," says the reference. In performing their study, researchers examined 38,397 adults who were either taking an antidepressant or methadone at some time between February 1990 and August 2011, a period of more than two decades. Antidepressants taken during that period by the patients involved in the study include citalopram (Celexa), escitalopram (Lexapro), fluoxetine (Prozac), paroxetine (Paxil), sertraline (Zoloft), amitriptyline, bupropion (Zyban), duloxetine (Cymbalta), mirtazapine (Remeron), nortriptyline, and venlafaxine (Effexor). Each participant received an EKG 14-90 days after they had taken their prescribed medication. Researchers found that all antidepressants affect the A-T interval in some manner, though methadone affected it more significantly by a great amount. In one drug, however - bupropion (Zyban) - had the opposite effect. The Q-T interval was shortened. But a shorter Q-T interval, by comparison, can also cause heart arrhythmias and fainting, conditions which can also lead to sudden death. The worst antidepressants - those which lengthened the Q-T interval the most, on average - were citalopram (Celexa), escitalopram (Lexapro), and amitriptyline, researchers said. Overall, one in five subjects taking these drugs experienced abnormal EKGs, and specifically longer Q-T intervals. Researchers said the clinical significance of these findings; however, is as yet unknown. We do know that an extended QT interval can result in sudden death. In reality, this doesn't happen often - though no one can quantify the frequency of death. So, it seems that the only ethical approach is to inform people of the potential risk of sudden death by taking these drugs. But we already know that genuine informed consent almost never happens. People are routinely told that the risk is minimal and the specifics are not stated. Ultimately, though, the only one who lives the results are the person inside your own skin. Earlier research also found that antidepressants caused a lengthening of the Q-T interval. In 2004, Dr. Dan M. Roden, of the Vanderbilt University School of Medicine, writing in The New England Journal of Medicine, said that, in the previous decade, "the single most common cause of the withdrawal or restriction of the use of drugs that have already been marketed has been the prolongation of the QT interval," which can be "fatal."